You are here: Home / Commentary / Can’t We Have Kindness from Our Government? 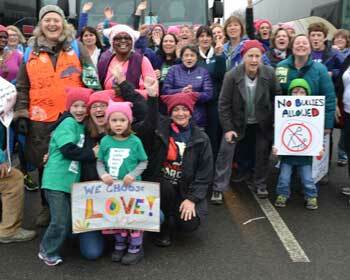 Two buses of Vermonters went to the Women’s March in Washington. I helped organize them. In November, when we started, we had no idea that the march would develop sister marches and that by the time the day was over there would be more than three million people participating in 914 marches worldwide. (A high estimate is 5.2 million.) Washington, D.C., had over half a million people alone. I marched because I was horrified then and continue to be horrified that our electoral process has given us a president who is so unbelievably ill-equipped to be the “leader of the free world.” Our legislature is in the pockets of big money. I’m deeply worried. Many people are suffering in a political system that rewards corporations whose only interest is in making profit. Big pharma, big oil, big banks, big insurance and big media have no interest in making life better for citizens. One example that particularly galls me are the usurious interest rates on credit cards. Lots of energy is going to be expended trying to minimize the harm caused by the forces currently in charge. Wouldn’t it be so much better if we had a government that wanted to be kind to our citizens? This is not a delusional idea. Other countries take care of their people. We used to take better care. When Lyndon Johnson signed into law The Older Americans Act (OAA), it created a foundation of services to support older adults so that they could live independently as they age. As Johnson said at the signing, “[the act] clearly affirms our nation’s sense of responsibility toward the well-being of all of our older citizens.” That was fifty-two years ago. Meals on Wheels, Senior Centers, and caregiver support services are among the programs that the OAA funds. But they are not enough. If the political climate were different, if taking care of citizens were the top priority, there would be active work on legislation to deal with the housing crisis older Americans are facing. We know there is a crisis. In 2014, the Joint Center for Housing Studies of Harvard University published a detailed report warning that “The nation is facing a lack of affordable, physically accessible and well-located homes for America’s aging population — especially those with low incomes.” The federal response to this crisis seems to be to ignore it. This is not kind. The lack of affordable housing is a crisis and the lack of help in finding solutions is causing much anxiety and fear. I hear it in the people who find the sharing housing site and write for help. Here are two emails I received recently. The options I can recommend are few. There are some home-sharing programs that offer matching services. Each is specific to a geographical area. You can find those that exist at the National Shared Housing Resource Center. There are Web-based matching programs specifically for seniors. Silvernest, Roomates4Boomers, GoldenGirls Network and SeniorHomeShares are four I know about. My honest answer is that at this time, with this government, it’s a do-it-yourself world. I write to these inquirers and encourage them to learn how to screen potential home-mates by reading Sharing Housing, A Guidebook for Finding and Keeping Good Housemates. If they can’t afford it, I suggest that they ask their local library to get a copy. I offer the Compatibility Assessment to help in conducting the interview process. It’s something, but not enough. There’s more that can be done. There’s more that should be done. The housing crisis for seniors is going to get worse. Why can’t we have a government that is kind to its people? P.S. Don’t tell me we can’t afford it. We can. It’s a question of our priorities. Really, all of these problems suddenly appeared after Trump was elected? Never said that. Actually, I think we started going the wrong direction in the 1980’s. The very large problem in this country is that we no longer seem to elect people who believe in government FOR the people. What seems to be the controlling idea is greed. More money for corporations and those who already have money and less for everyone else. Greed, as you might know, is considered one of the seven deadly sins in the Christian faith. Other faiths agree and describe it differently. I believe in that government should care for it’s people and through public policy provide for safety and security. That’s how it was when I was a child. I hope we can get back to it. You seem like a sensible person. You are prejudging what the Trump administration will do. Give them some support and time. If they have screw up, it can’t be as badly as the last administration. I’m 79 and rely on SS which I paid into my entire life. In the last eight years any small increase has been eaten up by Medicare, which I also paid into over my lifetime. Indeed, I try to be a sensible person. As I said in my piece, I think kindness is a value that should determine what kinds of laws are passed. Government is and should be very different from running a business, but we seem to have forgotten that. Trump has made the promise not to cut Social Security it is true, but he is surrounding himself with people who are on record for saying that they want to privatize it. The fact that your Social Security is barely enough is not the fault of Obama, but rather the Republican Congress that refused to let benefits go up and even reduced them. See this link. I sincerely hope that nothing happens to Social Security. There are so many who are dependent on it – but it often isn’t enough to cover living alone. That’s the whole point of why I’m working to help people realize that they could share housing. Thank you. You have helped me understand how he got elected.